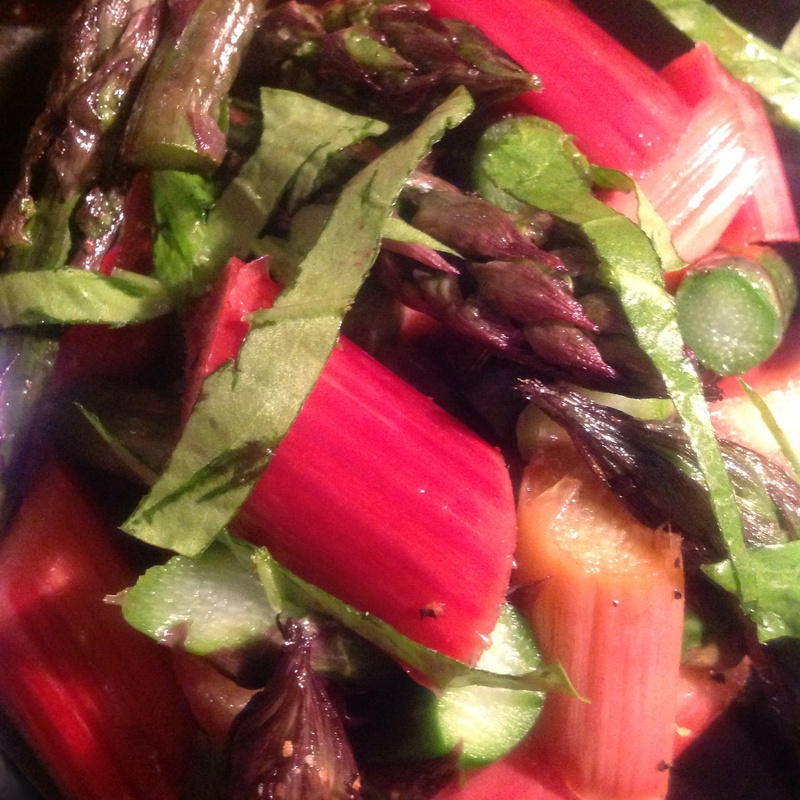 Rhubarb, quick-pickled with purple asparagus and sorrel. | ostrich milk. Study: RHUBARB 2.2 Quick-pickled with purple asparagus and sorrel. On his journey to visit the Great Khan, Marco Polo diverted northward into a mysterious mountained “Country of Rhubarb” in Northwest China. There, he fell in awe of the “great abundance” of actual rhubarb prized in Europe. High-quality rhubarb was a big deal in those days. Europe remained ignorant of what rhubarb plants actually looked like — centuries would pass before rhubarb would be used for, like, salad, and not, say, charlatan humor-balancing. So, much of what Silk Route traders passed off to westerners like Polo as medicinal rhubarb root was actually a cheaper, easily available species of wild sorrel. I wonder how rhubarb and sorrel taste together. Sorrel, like rhubarb, contains high levels of oxalic acid, so they might share other yummier molecules, right? On a first nip, the stem of a sorrel leaf tastes like a slightly-more citrusy, bright, chlorophylly rhubarb stalk. Let’s de-acidify the rhubarb, re-acidify it with something else, then put the rhubarb acid back in with sorrel. A quick pickling method displaces some of the rhubarb’s unfamiliar acidity with the more familiar acidity of vinegar. 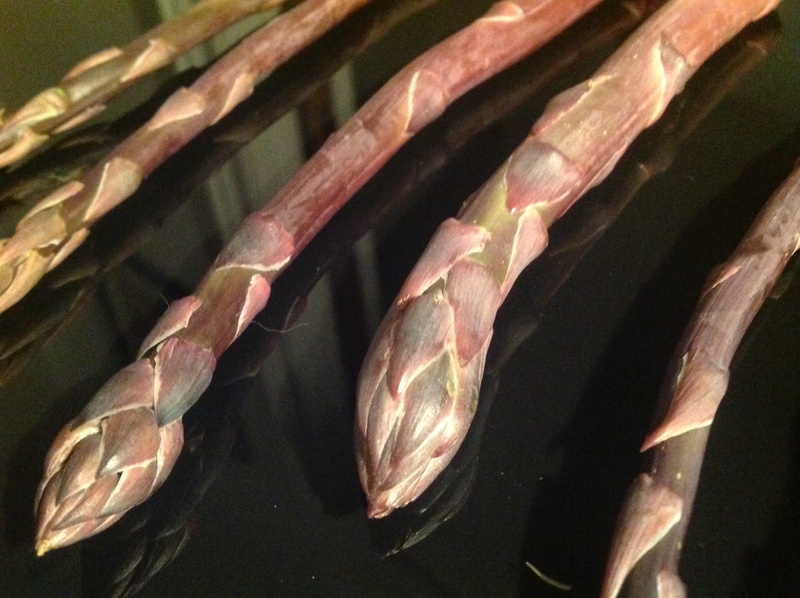 Trim asparagus spears. Coat with olive oil, salt, pepper. Roast in baking pan at 300F for -10 m. Mince sorrel leaf. Toss. 1.5 cup good white wine or apple cider vinegar. Maybe add a salty ingredient, like a cured meat, or, yeah, goat cheese. Stephanie Izard’s rhubarb salad with asparagus using a quick pickling technique, and, umm, goat cheese. Probably better than mine. This entry was posted in Rhubarb, Studies and tagged insulting celebrity chefs, maybe toxic, molecular flavor pairing, recipes, Rhubarb, salad, Sorrel, Studies. Bookmark the permalink.